You call me “Sir” and approach from down when addressing me, son! The pup has received a strict and heavy-handed (and probably not-expected) retort and rejection to his enthusiastic, happy invitation to play. He responds, expressing his feelings through tucked chin, ears swiveled back, squinting eyes, tight jaw — not so different from our own painful grimacing to such a retort. The flopping over is rather melodramatic, but I know human kids who might have done that! :)) I’ve seen coyote pups react this way many times — usually when they are conflicted: it’s as though all synapses fired at once without a clear outcome! I spent several hours observing the family yesterday, mostly because I wanted to catch a glimpse of the pups. I thought there were two, and based on my observations, I have no reason to suspect more. It was well worth the wait. The pups bounded out of the den area toward mom looking very much like similarly-aged, wiggly, exuberant canine pups. 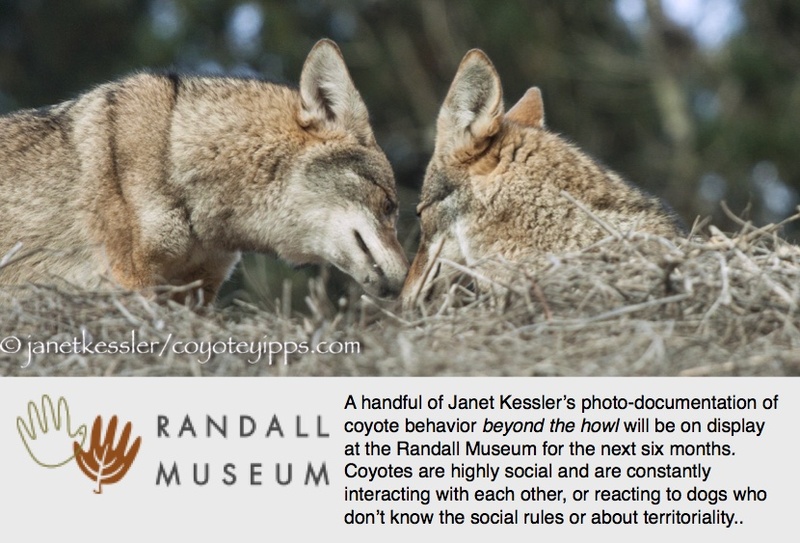 When asked what word comes to mind when folks think of coyotes, most are probably not inclined to say adorable, but I am convinced this is because we don’t often get the chance to watch these creatures interact with each other. These pups were utterly Adorable. They showed appropriate deference to mama, and when she nudged them back into hiding, they complied obediently. They appeared so energetic that I wondered what they do all day–how are those energetic little bodies confined to what appears to be a small den area? This is purely speculative, but I imagine they do sleep a fair amount, at least during the hottest part of day. I also began to wonder about the parents–what having a litter would be like, for instance, for the first time? How startling would it be that suddenly this mix of instinct and responsibility becomes your single overarching biological imperative? How stressful would it be to try to protect your babies in the wild? I realized that part of the fascination in observing this family is watching instinct in action, animals with no agenda other than pure survival and all the attending struggles and challenges inherent in it. It’s quite beautiful. Surrounding the area, people passed leisurely, most looking down at phones. I had a million gadgets myself– a phone in my pocket, a clunky camera around my neck. It brought to mind the most obvious thought: of course we sometimes harbor an irrational fear of wildlife. We know next to nothing about what their experience is really like. We are so removed from our own inner-wild (conditioned as we are to tame and master our own, uglier impulses) that witnessing that shadow side–that latent part so familiar to our most distant ancestors (and the very thing coyotes depend upon to thrive) can be spooky, but also exhilarating. Anyway, we certainly have more in common than not–all it took to convince me of that was to watch a mama with her two adorable babies. You can see by this pic how well the pups blend in! During a calm early morning walk I spotted a coyote running at top speed, bounding in long leaps, through some brush in the distance. Within seconds I could see that this coyote was chasing another coyote who was running lickety-split from his pursuer. Soon the larger, faster, and older coyote caught up and threw the youngster on his back and pummeled him with his snout, delivering a few emphasizing nips in the process. There was intense rustling of the brush and squeals of pain — the same squeals of pain a young domestic puppy might make if it were hurt. Soon, Dad, because that’s who the disciplinarian was, and discipline is what was going on, descended from that clump of brush where the beatings had occurred, walked on a few paces, and then stopped to look back, to glare back. He remained in this location, turning his attention to sniffing and looking around, and then headed back into the brush where the youngster was. Dad was checking to see if he had gotten his message across. He re-emerged again, glared back again, and then sniffed around some more. He repeated this about four times, and then finally wandered away from the area through the dense foliage. Soon, within minutes, Mom appeared from out of nowhere. I don’t know if she had witnessed what went on, or if she just happened by at this time. She looked around and slowly headed to where the youngster was. She found him, greeted him, and offered consolation in the form of grooming and affection. Several minutes later, they both emerged to where I could better see them. Mom spent time carefully grooming the kid who stood still and lovingly absorbed all the attention directed at him, and he returned the favor, a little. Soon she stopped, and both coyotes directed their attention towards where I was, but it wasn’t me they were watching. Dad suddenly appeared at my lookout point, a point with a good view of where the other coyotes were. Dad was keeping an eye on them. He spent a few minutes staring at them, and they at him. I had left my crutches (I had twisted my knee several weeks earlier) at the base of the steep and craggy slope with dry grasses which I had inched my way up for a better view, scooting myself upwards on the seat of my pants. I was now 30 feet from the crutches at the base of the hill. The coyote stopped to look at the crutches and then went over to a piece of trash, sniffed it and marked it. I was sure he was going to mark my crutches, which had my scent on them. But no, instead he looked at me respectfully and went on his way without leaving me any messages! He disappeared from view. Youngster and Mom were sitting perfectly still. Their eyes followed Dad’s trajectory until he was out of sight. Then they continued their activity of grooming and being groomed. I wondered if Youngster had actually been wounded by Dad, because, although I couldn’t see any damage to him from the distance, Mom’s actions suggested to me that she might be licking small wounds on his haunches. Pinch/bites are messages that dominant coyotes give other coyotes, and dogs, to message them to leave. After the Youngster had regained his composure following Dad’s treatment, and with the help of Mom’s grooming, affection, attention and solace, Youngster began feeling playful. He jumped over Mom, which must have been a signal or invitation to play. She acquiesced — parent coyotes love playing with their youngsters. After a few minutes of playful wrestling, she led him on a long extended chase up and around and through the bushes and back, over and over again. More grooming ensued and then these two, as Dad had, disappeared from view. Had Dad been disciplining Youngster for failing to be submissive? Or was there a lesson in boundaries and territoriality, or possibly an issue about the youngster’s safety at the center of Dad’s tough discipline? Dad’s intense bullying is disciplinary now. This pup is 7 months old and there is a lot to learn. Mom’s affection and solace seem to compensate for Dad’s harsher attempts to discipline and teach. Both parents teach and discipline, but it always appears to be the alpha — and the alpha can be either the male or female parent — who is the harshest. The alpha is the coyote who maintains an overall overview of the situation in his/her territory, keeping an eye out for everyone’s safety.